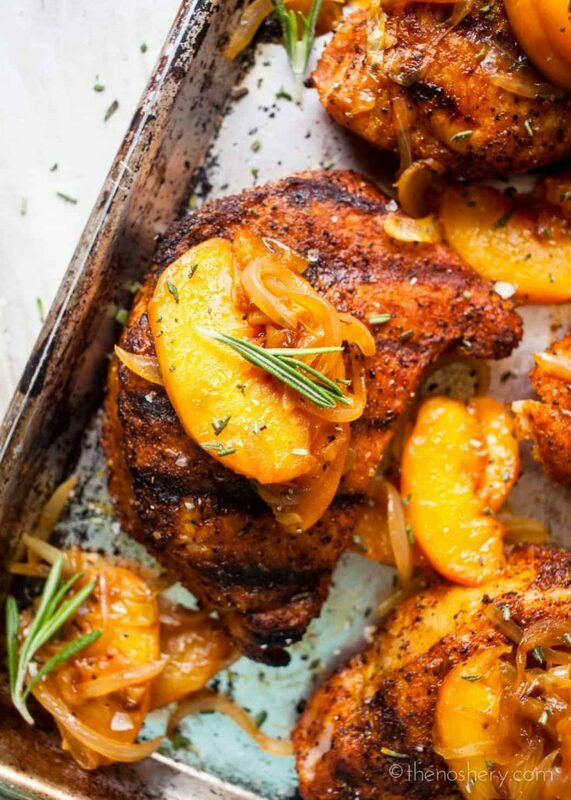 Pork Chops and Peaches | Pork is classically paired with apples. 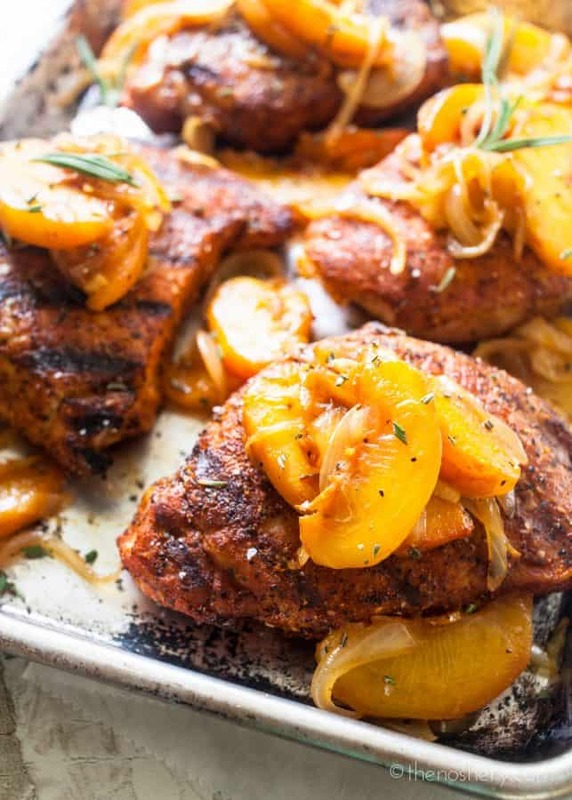 This summer version pairs BBQ dry rubbed pork chops with sauteed peaches. A simple and healthy dinner. It’s time for grilling, BBQ, pork chops and peaches! Soon enough peaches will be everywhere right? Beautiful, glorious, juicy peaches. I was at the store trying to decide what to make for dinner. I knew I wanted an easy and healthy grilled pork chop recipe. But I wanted to try something different. And since I found myself surrounded by peaches I took it as a sign. One of the most classic pairings is pork and cinnamon apples. So, I thought that pork chops and peaches instead of apples would be a great summer version. With pork, peaches, and grilling on the brain, I first thought of making a peach bbq sauce but I wanted this to be easy so, I didn’t want to make a sauce. An easy way to add BBQ flavor without having to use a sauce is a dry rub. I grabbed my favorite BBQ dry rub and I was ready to go. The great thing about this recipe is that it’s so simple and yet so flavorful. If you want to maximize the BBQ flavor you can rub the pork chops and let them sit overnight. Also, I chose to use fresh peaches for this recipe because it’s peach season. But, if peaches are out of season or if you want to save a little time it’s ok to use frozen peaches. Also, although I recommend peeling the peaches it’s not an absolute. I believe that the dish is more appealing without the skin but it will not affect the flavor of the dish. It’s more of a texture preference. For this recipe, I used ghee which is clarified butter. Ghee can be found in the butter section of many grocery stores and health food stores. I choose to use ghee only because I am trying to cut some dairy from my diet. However, if you cannot find ghee you can easily make your own or use butter. 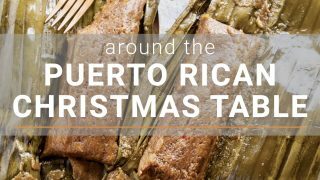 If you appreciate sweet and savory dishes you will love this one. The pork is flavorful and smokey which is balanced out by the sweet peaches. Make the most of all the glorious peaches in stores right now! If you are a fan of peachy recipes try my Grilled Peach and Bacon Pasta Salad with Herb Vinaigrette or Summer Fruit Dinner Salad. Pork is classically paired with apples. 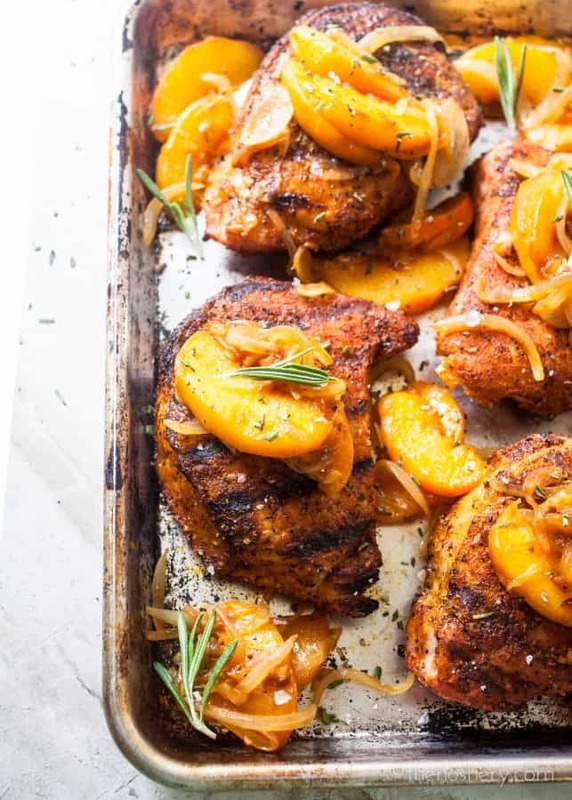 This summer version pairs BBQ dry rubbed pork chops with sauteed peaches. A simple and healthy dinner. Season pork chops generously on all sides with bbq rub. Sprinkle with salt and set aside. Fill a pot with enough water to cover peaches. Bring a pot of water to a boil and lower to a simmer. Cross score the bottom of the peaches. Fill a bowl with ice water and set aside. Place peaches in a pot for 10 - 20 seconds. Using a slotted spoon transfer to ice water. When cool enough to handle cut the peaches in half and gently twist to separate. Using a paring knife peel the skin of the peaches. Slice the peach halves into 1/4-inch slices, set aside. Heat a skillet over medium-high heat. Add ghee to the skillet. Add onions and saute for 3 - 5 minutes. Add garlic, peaches, ginger, and rosemary. Season with salt and saute for 5 minutes or until peaches are tender but not falling apart. Remove from heat and set aside. Heat grill to medium heat, until you can hold your hand over the grill for 4 - 5 seconds. Place the pork chops on the grill on direct heat for 2 - 3 minutes each side. Move the chops to indirect heat and cover the grill. Cook the tops until they or firm to the touch or reach an internal temperature of 145 degrees, about 15 minutes. Transfer chops to a platter and let rest for 10 minutes. Reheat the peaches. 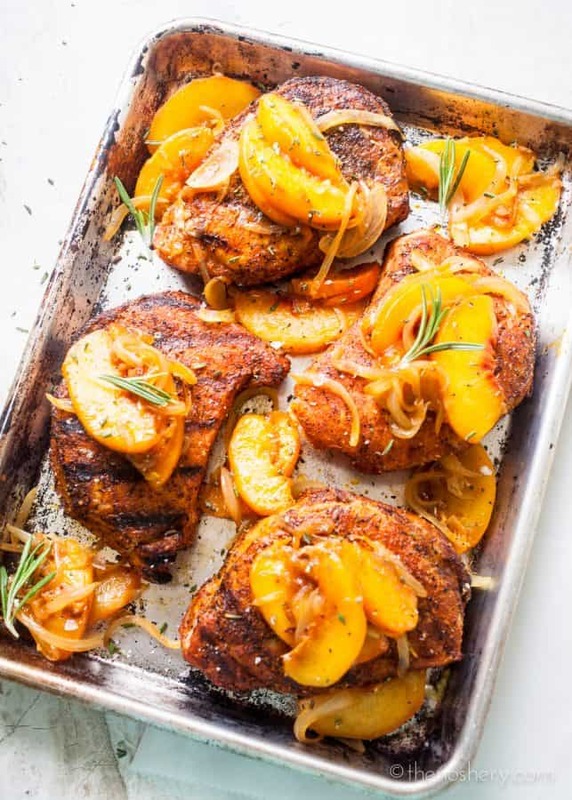 Serve chops topped with peaches. Ghee can be found in the refrigerated section of your local health food store. If you cannot find ghee you can use butter. If peaches are not in season you can substitute with frozen peaches. This looks like an incredible meal! We’ll be getting a box of peaches delivered soon – I think I know one meal I’m going to make with them! !